Recently, as part of a personal feminist book-a-thon, I read F-Bomb: Dispatches from the War on Feminism by Lauren McKeon. I was particularly intrigued and interested in reading the book for two reasons. First, I know Lauren McKeon personally. She and I spent a fair amount of time together for an article that she wrote about me in Toronto Life Magazine. Second, I had been notified that her book talked about me and a number of my fellow pro-life activists. All that to say: I was curious to read what she had written and what her take was on my overtly pro-life feminist stance. Then I came to Chapter 8, which is titled “Teen spirit: Clinic closures, access attacks, and the pro-woman rebranding of today’s anti-abortion activists.” And this is where things went downhill. I had hoped that, unlike most pro-abortion feminists, McKeon would have taken time to truly get to know the pro-life feminist movement. She had been relatively fair for the duration of the book, having the decency to humanize her opponents prior to critiquing them (which is an approach that I found quite effective and engaging). Unfortunately, McKeon’s evaluation of pro-life feminists such as myself fell woefully short. “The linguistic pairing of anti-abortion and pro-women messaging is like a conversational escape hatch for those who don’t want to admit they’re limiting women’s rights, even though they are” (McKeon, 2017, p. 201). In case you are wondering, this is one of the most overused “arguments” that pro-abortion advocates like to level at pro-life individuals. Pro-tip for all of you pro-abortion individuals out there: This argument is really, really weak, so you might want to try mixing things up a bit. First, there is the accusation that, by opposing abortion, pro-life people are “limiting women’s rights”. If you believe that a woman has the right to exercise coercive control over the body of another human being, and if you believe that a woman has the right to ask a physician to end the life of this other human being, then sure—you got me! I’m limiting a woman’s rights! But in order to make that claim, you would need to show me where, in any legal or constitutional document, women are actually guaranteed these “rights”. Spoiler alert: You won’t find any legal or constitutional document protecting these “rights” because these “rights” do not exist. Let’s say, for the sake of argument, that I attack someone on the street. You call the police. The police arrest me. I accuse you and the police of limiting my rights. I am implying that you have done something wrong. Do I have a fair point? While I may have the right to liberty, the Criminal Code provisions against battery and assault directly limit my right to liberty. In fact, these limitations are necessary in order to ensure that you and other citizens have your right to liberty. If these limitations were not in place, all manner of rights would be infringed upon. Therefore, in order to ensure social order, peace, and stability, limitations are placed on our rights on a regular basis. And it is undeniable that, while these limitations may restrict my personal right to liberty (which I interpret subjectively as bad), they create greater collective liberty in society (which we acknowledge objectively is good). So just because pro-life people want to limit women’s “right” to forcibly control the body of another human being (which we have already established is not actually a right in the first place), does not automatically follow that pro-life people are doing something bad—or that we are creating “a way for society to control women”, as McKeon later asserts (McKeon, 2017, p. 201). But this wasn’t the only stale, pro-abortion, isolationist tactic that McKeon relied upon. 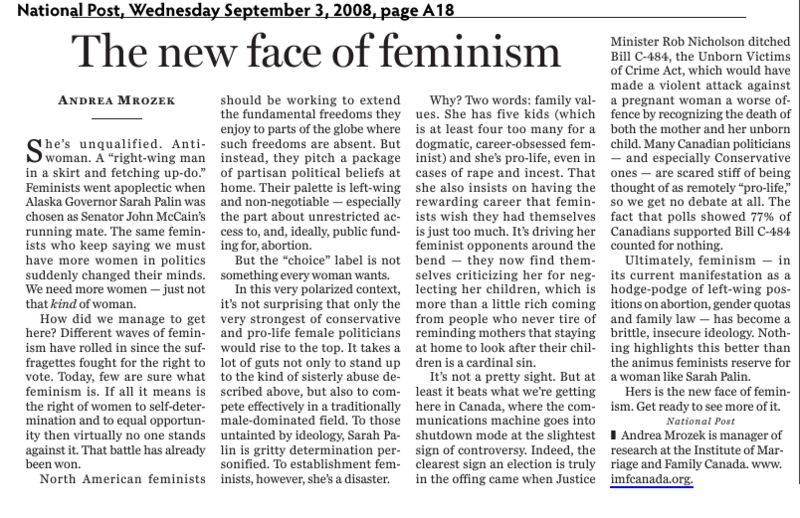 She also played the age-old you-can’t-call-yourself-a-feminist-if-you’re-anti-choice card, stating that the “anti-abortion movement’s women’s rights makeover” is “at odds” with the “wider feminist movement” because “[f]eminism, after all, generally works to broaden what we can do and achieve, not restrict it” (McKeon, 2017, p. 218). “You can’t choose to be a feminist. Real feminists support choice! And you, obviously, don’t support choice. And since I am a real feminist who supports all women’s choices, I’m not going to allow you to choose to identify as a feminist. I don’t support that choice because I am a real feminist who actually supports women’s choices….” (and so the idiocy continues). My hope is that, as you read and re-read those lines, you will see the glaringly obvious double standard that “pro-choice” feminists have created, with the express purpose of excluding, ostracizing, and demonizing pro-life feminists. If you don’t see the hypocrisy in that line of “reasoning” (if you can call it that), then you will have successfully rendered me speechless (for all the wrong reasons). “But I do believe we have to let go of our liberal superiority, the belief that clearly reprehensible views aren’t powerful enough to gain mass traction” (McKeon, 2017, p. 269). Now, to be fair, McKeon has discussed many views throughout her book, so she is not leveling this statement exclusively at pro-lifers. But there is something so beautifully ironic about McKeon counseling her readers to “let go of [their] liberal superiority”, while she simultaneously puts on a brilliant display of her own sense of liberal superiority by blanket-labeling entire segments of the population—including all pro-lifers—as holding “clearly reprehensible views”. My pro-life feminism may be a reprehensible view to her, but it is a justifiable and logically consistent view to me. And the fact that she and other radical pro-abortion feminists like her feel entitled to exclude me and my fellow pro-life feminists from their supposedly inclusive, tolerant spaces tells me that their version of feminism is undeniably deceptive, elitist, and hypocritical. And that seems “clearly reprehensible” to me. Thanks for reading and reviewing her book. I’d like to as well. She interviewed me in a coffee shop in Toronto a while back for this book. Was curious what came of that. I don’t think modern feminists realize the extent to which feminism is divided on this issue with women, strong women, on both sides. It’s always been that way. Back when NOW was getting started, abortion was hotly contested and women left the feminist movement over the issue, whilst simultaneously going on to fight for good change in the working world. My pleasure! It was an interesting read – I would still recommend it, since I feel it is important to read books that critique and counter one’s worldview. She is also a great writer, so it is a relatively easy read in that regard. Yes, you are absolutely right. In many ways, one of the great failings of the feminist movement is that, as McKeon and other feminists before her have stated repeatedly, “feminists eat their own”. There is so much division, strife, and extremism within the ranks of third/fourth wave feminism that it is unsurprising to see a new generation of young women who avoid the feminist label as much as possible. Feminism does not have the unity and community of the pro-life movement. Instead, they critique and criticize and nuance each other to death, eating their own movement alive. Lia, I agree with your logic entirely as always. Therein lies part of the problem – assuming McKeon’s article is written based on logic. As much as I admire your abilities and courage, you, as with most of us pro-life, pro-woman feminist supporters have a major “flaw.” We extend an undeserved “benefit of the doubt” to the pro-choice crowd that they may be even capable of approaching the critique of pro-life principles with even a modicum of logic, morals, honesty, and humanity. I am 75 and I have been fighting this “war” a long time, though nowhere near as effectively nor bravely as you have. Abortion is a mental illness that has manifested itself in the greatest self-inflicted human tragedy of mankind. Keep up the good fight and God be with you.